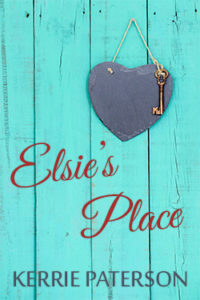 Today is release day for Elsie’s Place! It’s been a long journey for this book. I began writing it back in Jan 2013. It had a different name and a different storyline, but the same central character, Pat. A couple of months later, it had taken the basic skeleton of how it ended up. Twelve months of writing and re-writing later, and with lots of feedback from various people, it was finished. I entered it in a couple of RWA contests and came 2nd in the Ripping Start and 6th in the 2nd round of the Emerald. I subbed to agents and got a request for a full from one, but that, unfortunately, was the last I heard from said agent. I then subbed it to several of the major traditional publishers with no response. Eventually, I decided to self-publish and did another round of editing. Life took a detour and put my writing plans on hold for a while, but here it finally is. Even though it’s not in the physical bookstores liked I’d hoped it would be, I still love this story and I hope you do too! You can buy now from your favourite ebook retailer. Cannot wait to read it!!! Hurray and welcome to Elsie’s Place! This is an amazing read I can highly recommend. Don’t miss out on a beautiful story. Congratulations Kerrie, so proud of you for taking this leap forward. Best congratulations to you Kerrie. I wish you all the success with it. Fabulous to see this lovely story out in the world. Congratulations Kerrie – may if fly!